We were advised by my friend’s co-worker (who happens to be Peruvian) to not spend any time or money on Lima, the capital of Peru. In the winter months, Lima is a pretty depressing city to be in. It’s a city of grey – crumbling concrete buildings in the poorer areas, a sky that is terminally grey and overcast, even the ocean looks grey. It’s damp and cold from May until the end of November. SAD (Seasonal Affective Disorder) is a big problem here during the constant cloud and fog of winter. We were also warned that Lima can be dangerous – with pockets of poverty so extreme that those areas have been designated as no-go zones for tourists and travellers. 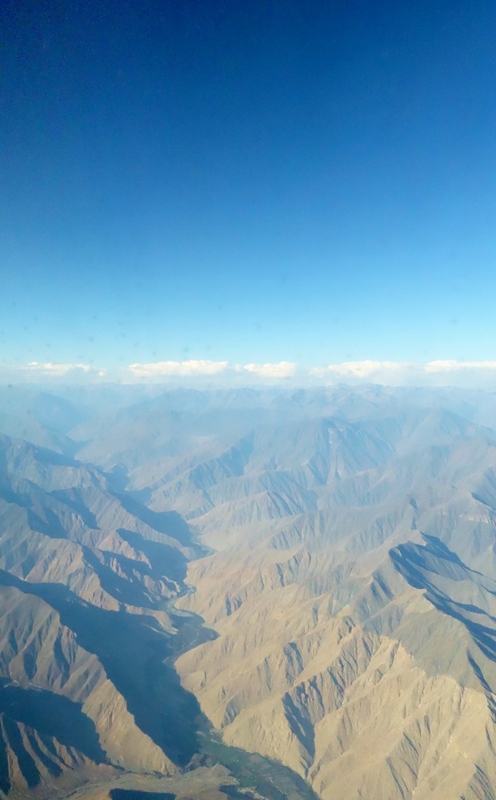 But after looking over our shoulders and mentally preparing for armed muggings for almost a month in Colombia, we felt like Lima was a breath of fresh air. We spent a lot more time out and about after dark, which we wouldn’t really dare to do in the bigger cities of Colombia. 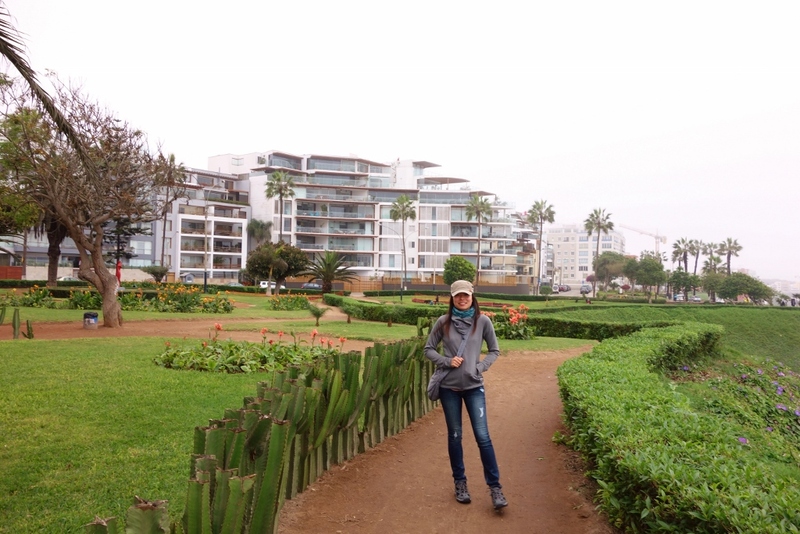 It helped that we stayed in the more modern and cleaner neighbourhood of Miraflores, which is known for its great restaurants and beautiful seaside bluffs. Winding paths and beautiful parks lined the bluffs in Miraflores. The government is investing a lot into beautifying this part of the city. One of the biggest reasons for spending a few days in Lima is the food. We’ve read the Peruvian cuisine is amazingly diverse, using its indigenous cooking as a base and drawing from Spanish, Chinese, Italian, African, and Japanese influences. On top of that, Lima is said to have world-class food. So after the disappointment of Colombian food, we were ready for what we hoped would be an ecstatic food experience. And we were not disappointed. Food in Lima was everything we had hoped for. Our first stop was ‘El Enano’, a very poplar, open-air sandwich restaurant that served delicious, greasy sandwiches. They also had a huge selection of fresh fruit juice concoctions served in huge glass pitchers to wash down the greasy sandwiches. 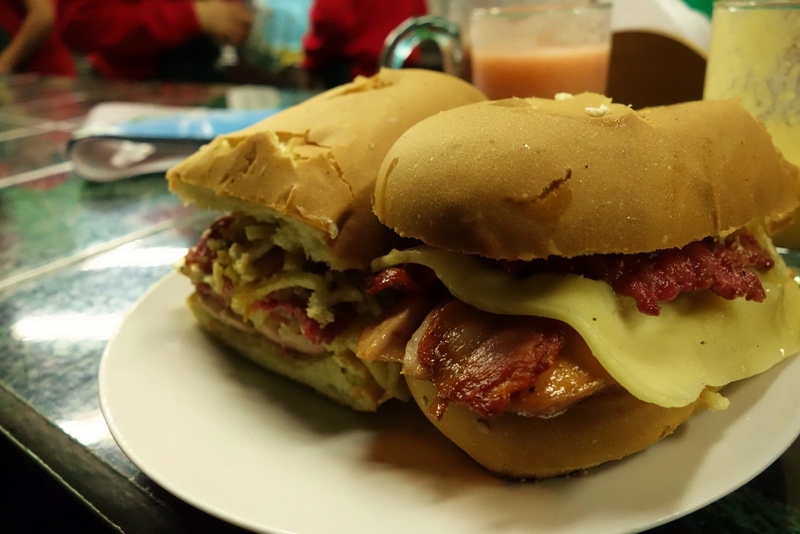 We both ordered the “El Enano” sandwich – a meatlover’s delight. Ham, bacon, pork sausage, and melted cheese sandwiched between toasted hotdog buns. The next day, we took the modern Metropolitano bus service (a quick, easy, and safer way to get around Lima) up to the sketchier area of Central Lima. 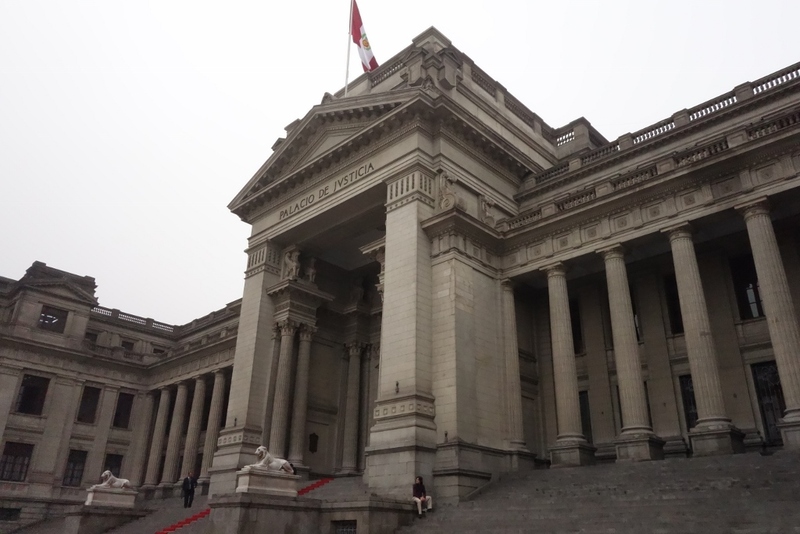 Most buildings in Central Lima were grey – to match the whole grey vibe of Lima in the winter. There’s a huge complex of individual clothing and shoe stalls called Polvos Azules (just southeast of Estacion Central). You can find cheap, branded clothing here but the area is full of pickpocketers so it’s best to go there earlier in the morning with only the money you plan to spend. We bumped into an American i-banker, straight out of business school, who was here in Peru for work for a month. He told us about the phenomenon of chifas (Chinese restaurants) that served huge inexpensive portions of Chinese dishes that were similar to those that you’d find in food courts back at home (i.e. Manchu Wok). 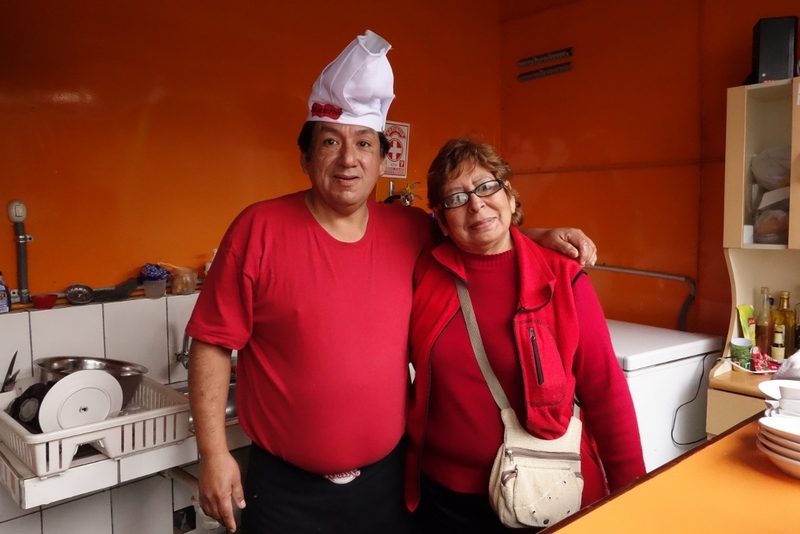 He joked about how Peruvians rave about chifas and insisted that he had to go and try the food there – but since he’s from San Franciso, he can have Americanized Chinese food at almost every street corner back at home. Chifa (or Peruvian version of Chinese food) in Lima. 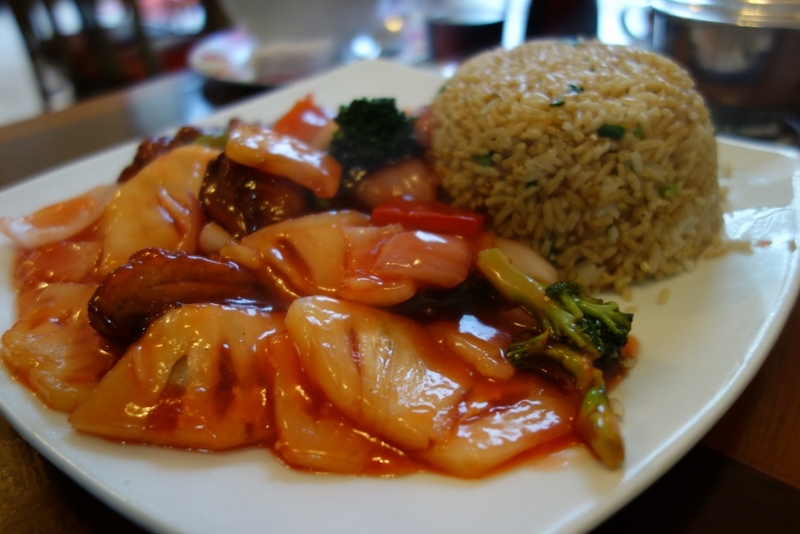 Sweet & sour pork and fried rice. 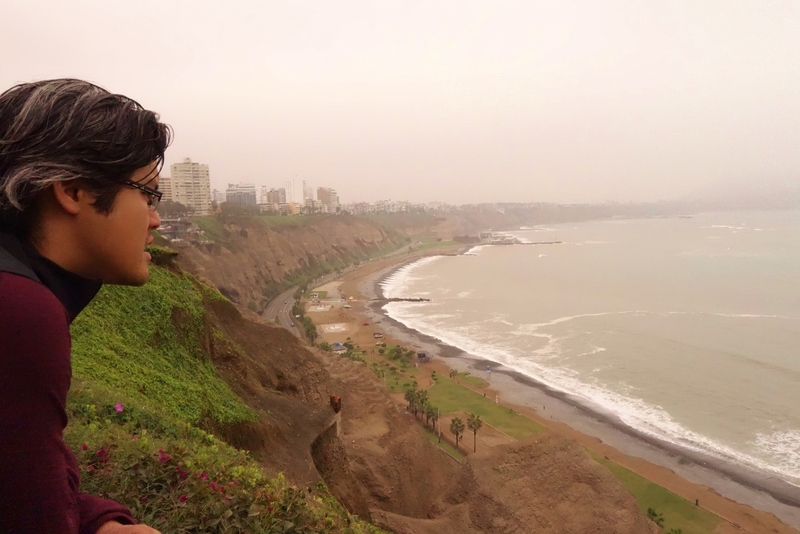 The next day, we decided to make our way over to Barranco, an artsy and Bohemian neighbourhood in Lima. It took us awhile to get there because we kept stopping at cafes along the way. 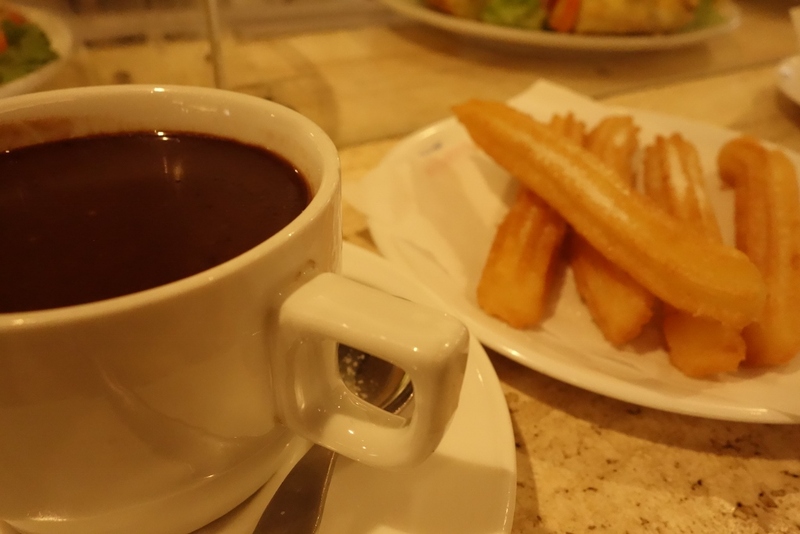 We tried some delicious churros with a side of hot chocolate for dipping. Crispy churros and hot chocolate. Delicious, crispy, and sweet bites of heaven. One of our favourite meals so far in Peru has been in a small open-aired ceviche stall, hidden near the back of a little market on Union street in Barranco. This mom and pop eatery was a hidden gem – very well hidden actually. 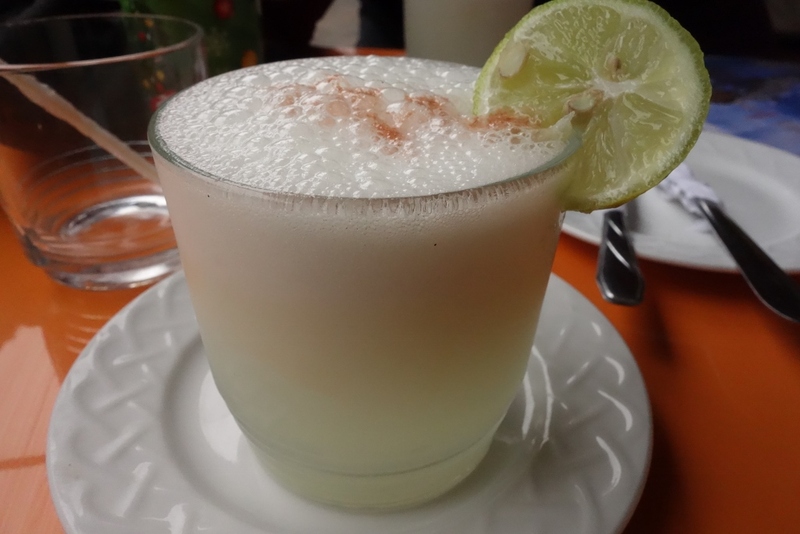 Pisco Sour – made with pisco, lime juice, egg whites, ice, and sugar. Very delicious and surprisingly strong cocktail. 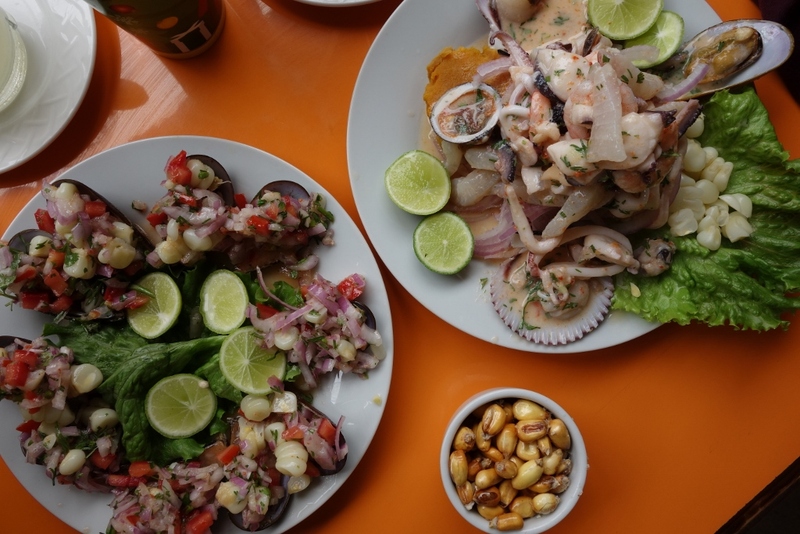 Lima, being right on the edge of the Pacific, is a great place for fresh ceviche. And unlike La Cevecheria in Cartagena, Colombia, this place definitely did not disappoint. It was probably the best ceviche I’ve ever had in my life. It was so fresh and tasty, with just enough tartness from the lime juice, and heat from the chilies. 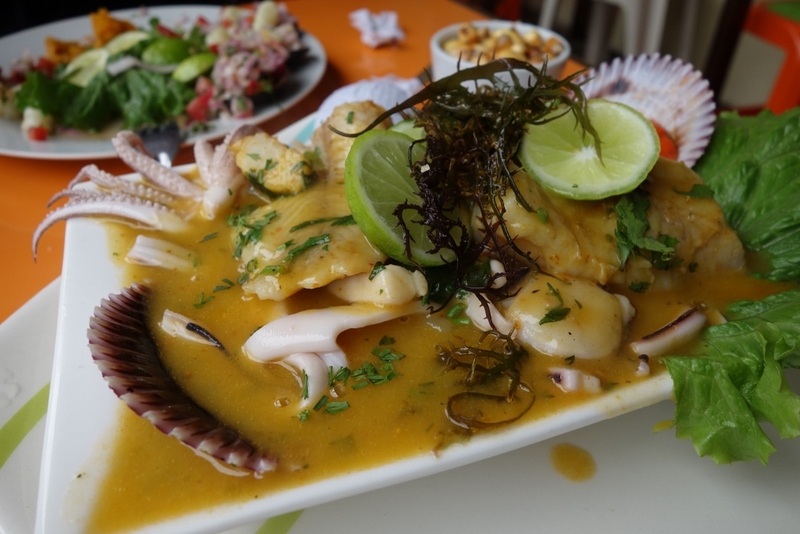 The best ceviche I had in Peru. The flavours were sooo intense! We also ordered the mixed seafood soup. Wow, flavour explosion! Savoury and tasty seafood stew. SO good. If our first stop in Peru has been this delicious, I am anxiously awaiting the gastronomical delights the rest of the country has to offer. Stay tuned!